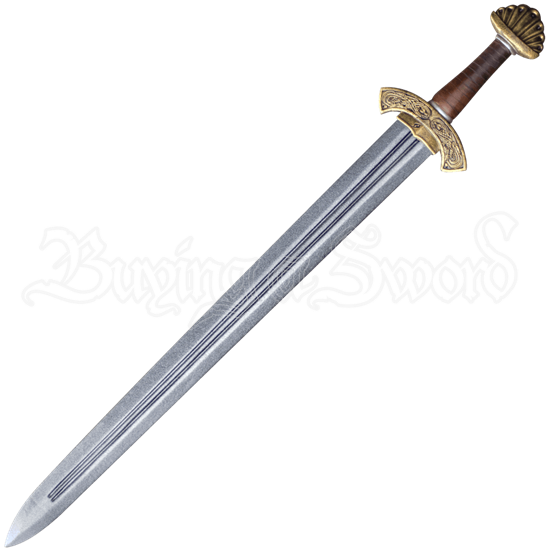 Take charge of the battle with the might of the Carved Hilt Viking LARP Sword in your hands. This distinguished foam latex weapon is expertly crafted for a captivating and realistic appearance made safe for use in LARP events. With a hilt that has been cast in polyurethane foam, the guard and pommel sport unique, golden colored details that appear as though carved out of metal, and the hilt displays a realistic, leather wrapped appearance. The mighty blade is made of closed cell, shred resistant foam around a fiberglass core, coated in latex for extra protection. Due to the handcrafted nature of this LARP weapon, its appearance may feature slight variations. This LARP sword is approximately 33.5 inches in overall length. This measurement will vary as each LARP sword is handmade.